The count of cycles, also known as clockticks, forms the basis for measuring how long a program takes to execute. How do you measure Execution Time? Kernel (Sys) Time Operating system code - the time of CPU spent on the kernel (system) code only within the given process - other processes and the time when our process is blocked are not included. 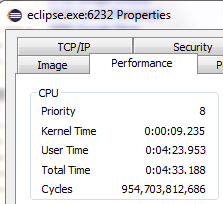 User Time Time CPU spends running the program code (ie CPU time spent on non-kernel (user-mode) code only within the given process – so other processes and the time when our process is blocked are not included.). The performance tab of a process in Process Explorer. 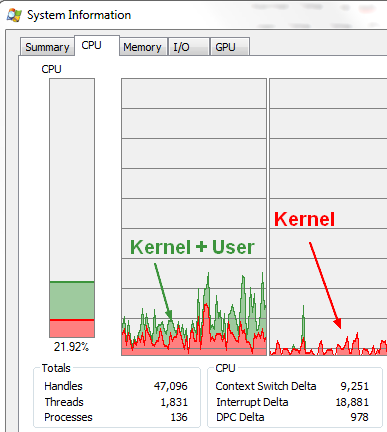 Red in the CPU usage graph indicates CPU usage in kernel-mode whereas green is the sum of kernel-mode and user-mode execution. A data collector set can be configured via logman.exe to log the “% Processor Time” counter in the “Processor Information” object for this purpose. Every conventional processor has a clock with a fixed cycle time (or clock rate). At every CPU cycle, an instruction is executed. CPI is somewhat artificial (computed from the other numbers using) but it's seems to be intuitive and useful.